Visit omni.goodhousekeeping.com and register for the Good Housekeeping Omni Orlando Sweepstakes by March 31st for your chance to win a 5-day Orlando Getaway for four at Omni Orlando Resort at Championsgate. 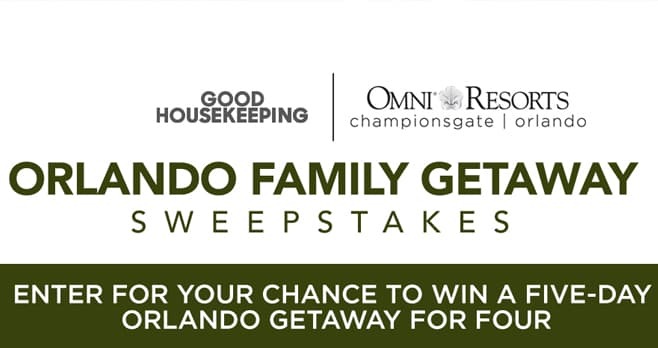 The Good Housekeeping Omni Orlando Sweepstakes is open to legal residents of the 50 United States or the District of Columbia, who are 21 years or older at time of entry. Legal residents of Canada (excluding Quebec) who have reached the aforementioned age in their province of residence at time of entry are also eligible to enter. The Sweepstakes begins February 1, 2019 at 12:01 AM (ET) and ends March 31, 2019 at 11:59 PM (ET). Limit one (1) entry per person for Sweepstakes. The grand prize consists of a trip for Winner and up to three (3) guests to Orlando, Florida, including five (5) days, four (4) nights’ accommodations at Omni Orlando Resort at Championsgate (one room for all four occupants) (waived resort fees), $250 resort credit, daily poolside cabana access, daily breakfast for four (4) guests, four (4) tickets to a theme park determined at the Sponsor’s sole discretion, plus a $1,000 gift card, which Winner, if he or she so elects, can use for transportation costs. Visit omni.goodhousekeeping.com to enter and see Official Rules for details. This trip would make a great family vacation for us! We have been wanting to explore Florida and this would be a great opportunity! Fingers crossed!! This trip would mean the world to my husband & I. This would be the vacation to show my great grandchildren Florida as I remember it. What is Y and X . You would not let me enter the Omni Sweepstakes. Ohhhhh….I love my Good housekeeping magazine,,,,,Also I would Love to visit Orlando again…it has been 20 yrs.WOW…What a great STRESS reliever that would be,,Thankyou for a opportunity to WIN. From snow to sunshine… would be a dream come true! Our children age 9 and 6 would love to be able to experience the Orlando vacation as a family. It has been a very stressful year as their daddy was diagnosed with stage 4 esophageal cancer. They have been so brave. I wish I could give them the moon with their daddy. Needless to say, the bills from treatment make it impossible to take a trip like this. It would be a dream come true for all of us. We live in one of the snowiest cities in the U.S. It would be so amazing to have a getaway to Florida and spend sometime in the sunshine! The Omni sounds fabulous, you are never too old to enjoy yourselves! I turn the big 65 next month, this would be the best birthday present ever!! A get away from the cold windy weather I have experienced the last 5 months to enjoy the beautiful sunshine and warm weather of Orlando!!! Hi can’t remember when I felt the warm sunshine on me; or seen green palm trees flow. Just need a vacation in the sun! Im 85 and havent been there.